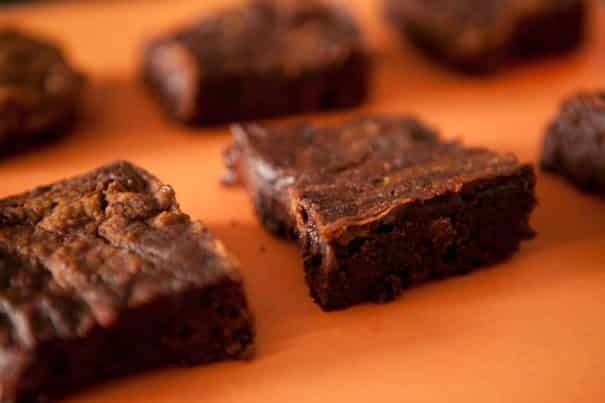 Delicious and Extra Fudgy 4 Ingredient Pumpkin Brownies. If you’re looking for quick Halloween recipes, then this recipe tops my list of easy pumpkin recipes. All you need is a box of brownie mix, pumpkin puree, pumpkin pie spice, and chocolate chips! So far this week, it looks like fall on Brooklyn Farm Girl, first pumpkin pie, then pumpkin muffins. I know I know… but I’m very excited for Fall. I love it! This is also the time when we start thinking of Halloween Desserts. The first thing I had to make with our fresh pumpkin harvest from the garden was pumpkin brownies. I had such a great success with my pumpkin whoopie pies that pumpkin brownies were next on the list! I know these are going to end up on my table as one of my Halloween desserts this year. Did you know I love pumpkins? It’s true. Pumpkin puree is healthy too! 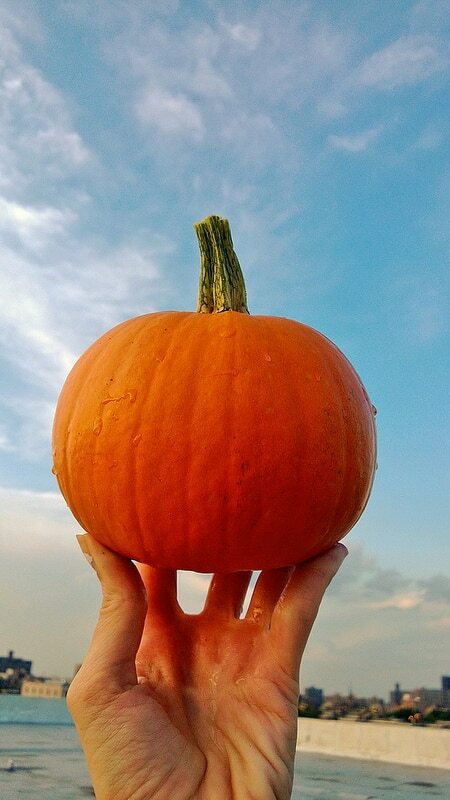 1 cup of pure pumpkin is 49 calories! Pumpkin is rich in dietary fiber, anti-oxidants, minerals, vitamins (vitamin-A, vitamin-C, and vitamin-E). Did I mention it’s delicious too? Because it really is! I love you pumpkins, I love you! Other easy pumpkin recipes I like to make are my 5 ingredient healthy pumpkin cookies and my Pumpkin Roll with Cream Cheese Filling. 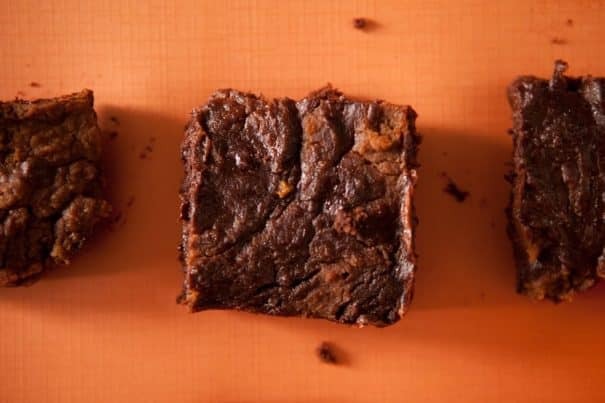 This pumpkin brownies recipe is so easy because it only involves 4 ingredients: brownie mix, pumpkin puree, pumpkin pie spice, and chocolate chips. If you notice there’s no butter, eggs or vegetable oil in these brownies. The pumpkin puree takes care of all of that! 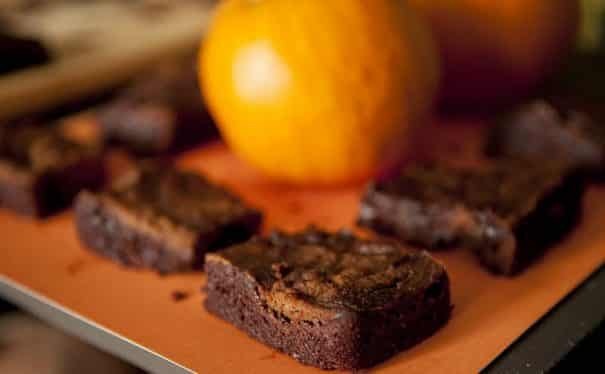 The pumpkin adds moisture to your pumpkin brownies so there’s no need to add those other fattening ingredients. 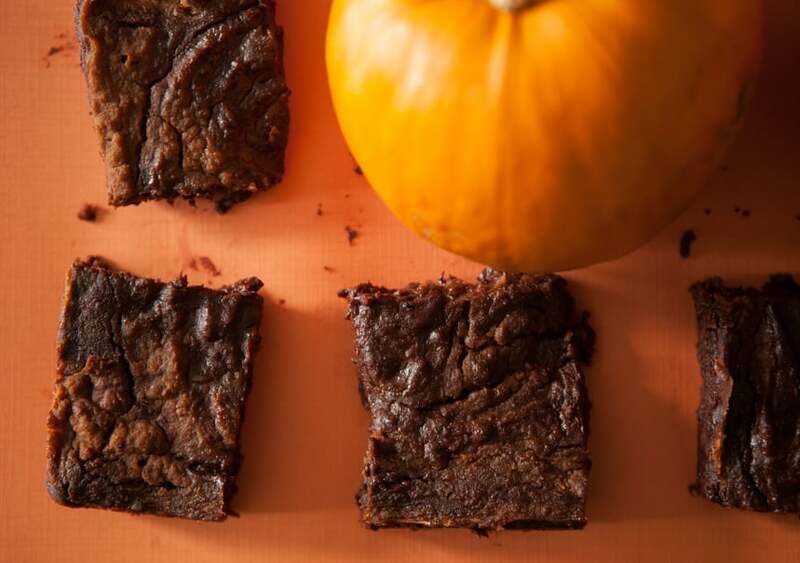 These pumpkin brownies are super fudgy. Warning: If you love pumpkin pie and chocolate, once you eat one of these pumpkin brownies you will enter a magical world. I also find that people who aren’t huge pumpkin fans also love these brownies due to how moist and chocolatey they are. They really are a hit all around for the brownie crowd. Here are your ingredients. Simple, right? Mix your brownie mix, chocolate chips and 1 1/2 cup of pumpkin puree together. It will look something like this. I demand (nicely) you take a spoon right away! Then mix your remaining 1/2 cup pumpkin puree and pumpkin pie spice together. First 3/4 of your brownie mix goes into your pan. Then your pumpkin mixture goes on top. Then your remaining brownie mixture on the very top. Swirl with a knife so it blends nicely with the pumpkin below it. 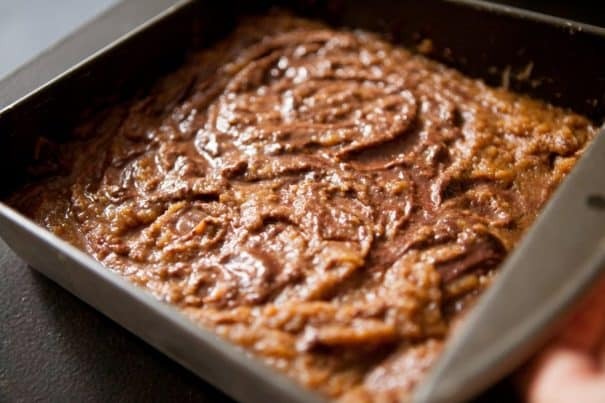 When the time is up, your pumpkin brownies will emerge from the oven with a delicious smell. Your entire kitchen is going to smell so good! Let the brownies cool to set. Cut up into pieces, I usually do 9 brownies per 8×8 tray. The edges remain firm to keep the brownies intact. But the middles are pure ooey gooey fudgy delight. Hope you enjoy these Pumpkin Brownies! Spray a 8x8 pan with nonstick spray. 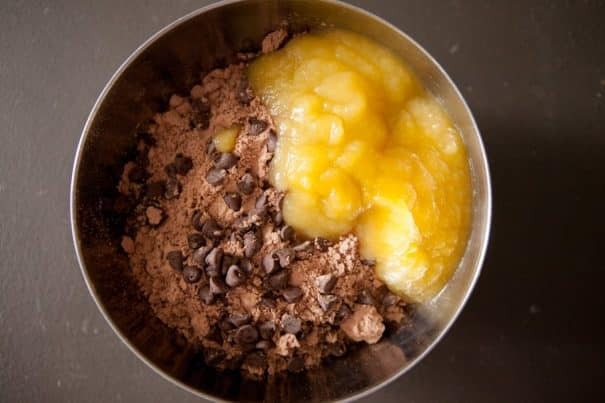 Mix your Brownie Mix, Chocolate Chips and 1 1/2 cup of your pumpkin puree together in a bowl. 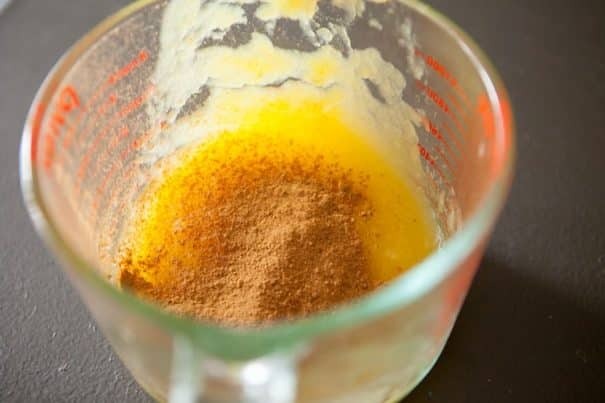 In a separate bowl mix the 1/2 cup of your remaining pumpkin puree and pumpkin pie spice together. 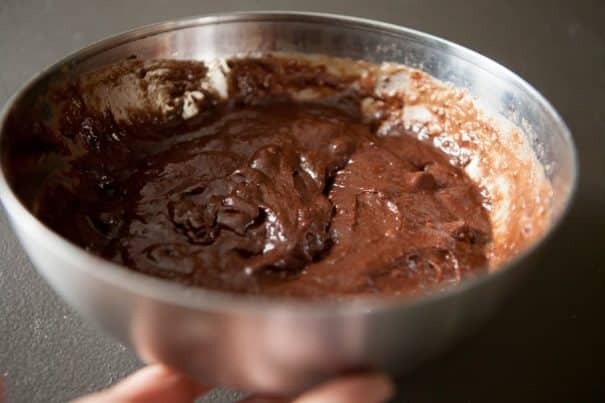 Spread 3/4 of your brownie mix mixture into your pan. Spread your pumpkin puree mixture on top. Spread your remaining brownie mix on the very top. Then with a knife gently swirl around the top layer of the brownie so it gets mixed up with the pumpkin puree. Bake 30-35 minutes or until a toothpick comes out clean. 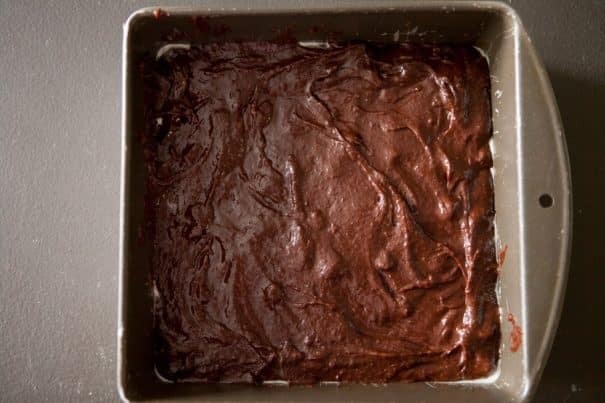 Tip: If you want your brownies more firm, store in the refrigerator. I want to enter this magical world you speak of, Gimme! I can believe it tastes good, I recently tried beetroot chocolate cake and was blown away by how sweet it was! Wow, looks so good…and it’s eggless. Perfect. Yes please!!!!! These look amazing. Oh thank god I’m not the only one craving pumpkin lately! These brownies are calling to me, Pamela! What a great flavor, and I love how easy they are. I love pumpkin, give me some pumpkin soup anytime of the year! I hope you try the, they are super yummy and easy to make! Yum! Bookmarking this for when it *actually* feels like fall in AZ! I love Fall and it’s never too early to start celebrating with pumpkins. The brownies look so decadent!! Super stupid question, but since i’m from the UK, we don;t use pumpkin a lot. We don’t have tinned pumpkin so i’d have to make my own pumpkin puree.. so um, how do I do that? Yep i’m an idiot. But these brownies looks so freaking good! 😀 I also need to hunt for brownie mix..! I think i should just move to America! It’s been feeling a bit like fall outside so these sound super appetizing! I love chocolate and LOVE pumpkin even more so these would be super dangerous for me! I kind of can’t wait for it to actually be fall now. Please come asap and bring your wonderful pumpkins and apples and pretty leaf colors and crisp air and fun holidays. I’m done with this summer crap. I’m coming soon! It will be be beautiful and I will supply many yummy recipes! 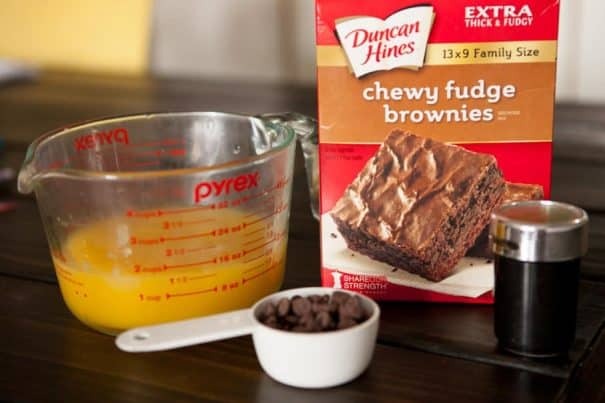 I don’t usually bake with brownie mixes, but this is totally worth making an exception for. And btw, I’ll take fall flavors any day of the year, so please please please keep ’em coming!! My husband love pumpkin anything!!! I’m going to be making these for him. Thanks for the recipe Pamela. By the way, what size brownie mix is that? I hope he loves them! It’s a 13×9 family size brownie mix box, 18.3 oz. Enjoy! 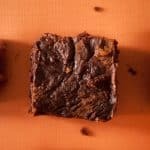 I’ve heard about using pumpkin puree in place of eggs/oil to make brownies, now I definitely have to try it out. These look so delicious! Thanks for stopping by Ada, these are definitely going to be my Fall brownie favorites! There is some serious batter left in that bowl. That’s I do things around here too. I like to lick the bowl, what can I say. I must have brownies, like right now! These are so fabulous!! You are on the roll this week with all the fall favorites! I love that you used whole 2 cups of puree, they must so moist and really delicious. Thanks for sharing all your fun ideas! We have a pumpkin farm across the street, it so fun to see them all grow. I love seeing those trees change, always such beauties! I’m actually pretty excited for fall, too. As much as I love summer, I LOVE fall food! These brownies look like a keeper! Fall is my absolute favorite – the best weather and the best food!! Especially pumpkins! I love them. I don’t want summer to end yet, but I do look forward to fall every year. I love pumpkin in brownies. I have the same feeling, summer is garden time with so many things growing full, but I looooooooooove Fall! This is a new-to-me recipe and definitely sounds like something I need to try! Oh wow – just looking at these brownies takes me to another place! Such an easy recipe! Thanks so much for sharing! Welcome to brownie land! 🙂 Thanks for stopping by Shashi! These looks very unusual – and super yummy ! I have to try this. I have made cupcakes with pumpkin but never brownies. Another item on my todo list after my kitchen renovations are completed. How’s the kitchen coming along, how much time is left? I bet you can’t wait! Have a great day! What a great idea! They look decadent. Okay, I HAVE to make these. My two favorite treats combined! Enjoy Anne! One of my favorite brownies! These look amazing. 🙂 Simple, easy, and perfect! I love pumpkin and chocolate together. Me too Sally! A favorite combination. This is a great recipe and I love how few ingredients are needed. Pumpkin is the special ingredient, though. Look forward to trying this recipe. I hope you enjoy Jovina! This recipe is perfect for me because it’s easy, it’s simple, and of course it has pumpkin! 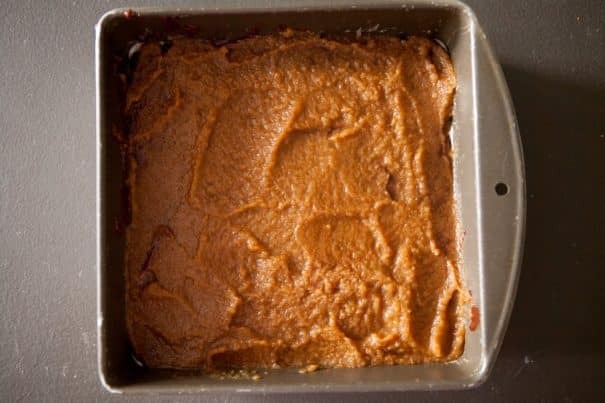 Pumpkin and other squash do amazing things in desserts and I love that you used the pumpkin to replace much of the fat! they look so good! I bake with pumpkin year round, too – just not blogging about it. Maybe I should be…I thought I was the only one! These are perfect! Thanks Averie, they are yummy yum yum! Oh lord!! These sound incredible…and SO easy! Super easy and delicious – enjoy Steph! 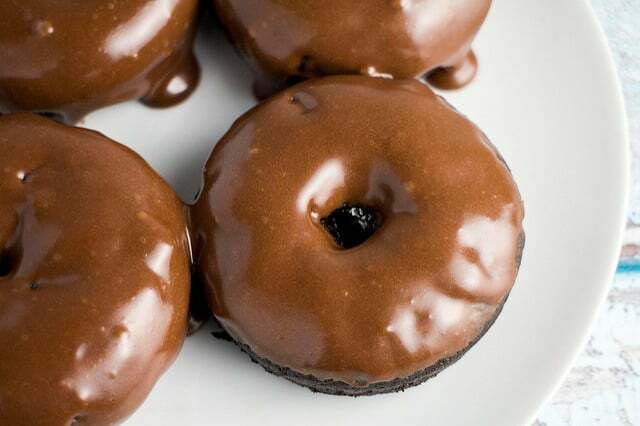 I am so going to make them tomorrow ! I made my own freshly roasted pumpkin puréé last Fall & stored mine in the freezer. i will use this pumpkin puréé. I defrost it now in my fridge! MMMM!!! They look superb even! Awesome to hear Sophie! I freeze all my pumpkin puree too, it lasts wonderfully! Enjoy! So glad you enjoyed them Sophie! Happy Brownie Snacking! Great to find your blog and extra great to see a pumpkin recipe! I’m all geared up for fall.. I can’t wait for Fall! Thanks for stopping by Gerry! I have done this before, not only is it fat free, but incredibly fudgey magic in your mouth! I’m getting really excited for fall too and I absolutely love anything with pumpkin but I especially love that there’s no added butter or oil in your brownies! Isn’t Fall the most delicious time of the year? I can’t wait! So easy I need to make these ASAP! I have been excited for fall since the beginning of summer – but these just pushed me over the edge into full on Fall Mode! Heavenly! I recently opened a can of pumpkin to give my basset hound a scoop. It’s supposed to help with tummy troubles, which he was having. So, now I have the rest of the pumpkin puree and was think about what to do with it. This recipe looks perfect! Hope your pup is feeling better! THIS. LOOKS. SO. DELICIOUS!! I’m ready for pumpkin, it’s never too early. Agreed! Pumpkin all year round! Thanks for the recipe! I just made these and they are so good!! 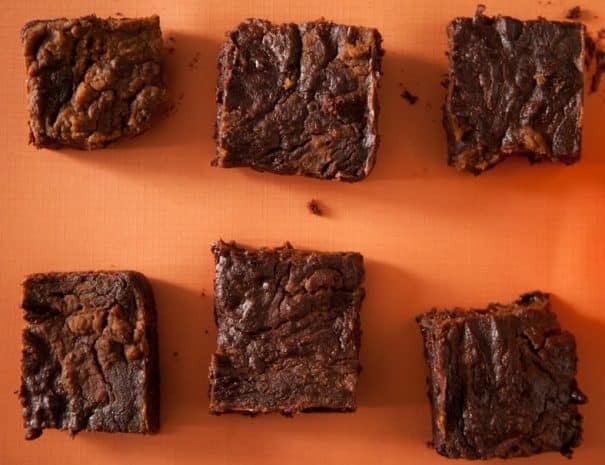 Why the hell is it impossible to find a pumpkin brownie recipe without chocolate?!?! chocolate and pumpkin together sounds disgusting to me! I love putting pumpkin in baked goods! I’m dying to try these. Oh, the cravings! I’m using this recipe in a bake off competition tomorrow!